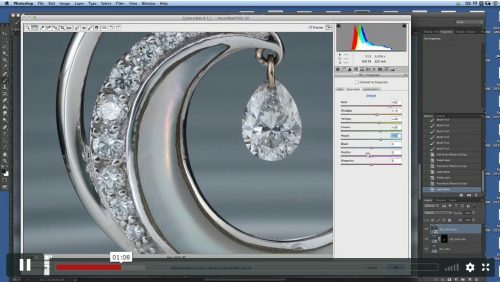 Creative Jewelry Photography course, "The Diamond Drop"
This training video is an advanced to Pro level workshop that takes you through the shooting of a Na Hoku Wave pendant and chain. In the video you will see how to take a subject from rough concept through the entire shoot and all the way to post-production of the final image. Alex Koloskov will take you step-by-step through the set up and shoot and provide you with everything you need to create a professional creative product shot that you will be proud to display in your portfolio. In the second part, Alex is joined by professional retoucher Genia Larionova who will show you techniques that will improve on your image by making it the best that it can be in Adobe Photoshop. When I have a question or trouble getting a shot, can I ask the instructor for help? Yes! As a course student, you will be a part of a private group and forum, where you can ask the instructor any question and/or post your results for review. We encourage you to participate in this group! Alex begins this course by explaining that this is a one shot class that presents how to work with an intermediate level client – this is a client that has some idea of what kind of shot that they want, but not as detailed as a client with a full marketing department. Here you will learn what the concept of the shoot for the Na Hoku Wave pendant and chain. Looks at the background setup for this shot. Here you will see how the glass table was built. Next you will see how the light behind the seamless background affects the shot. Demonstrates how to position the subject in front of the camera. While the hanging is pretty straight forward, you have to be aware of the difficulties in shooting Jewelry. This is because it is generally small in size and as such you have to get the lights and modifiers as well as the camera in close which lends itself to a very crowded space around the subject. Begins with setting up the focus and looking at the type of subject that you are shooting. This piece of jewelry is a glossy subject that has lots of metal and gem stones. In this lesson you will see how the proper use diffusers can help bring out the surface properly. Will show you how through the use of contrast lighting you can bring out the shadows and highlights. This will allow the glossiness of the metal to show through. You will also see how to eliminate the reflections of unwanted objects on your subject. Shows you how to generate movement in the shot. Here Alex shows you a couple different ways that you can create the ripple effect in the water and capture it in the camera. 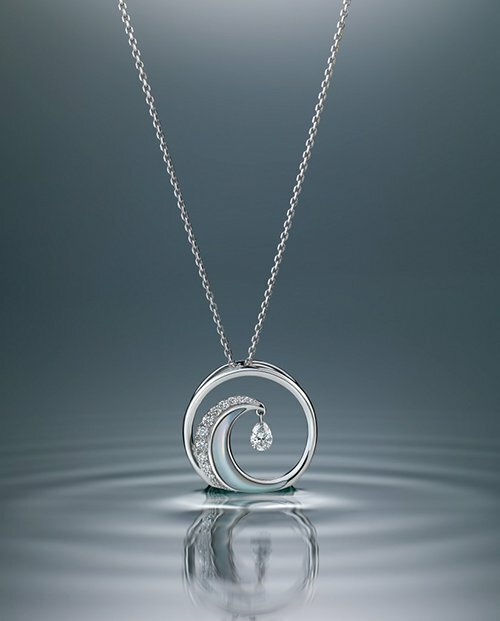 Finishes up with a summary the shooting of the Na Hoku Wave neckless and pendent. Begins by evaluating image for use in post-processing. Then you will see how to begin the processing using Adobe Camera Raw. Once the initial processing is compete then it is opened as a Smart Object in Adobe Photoshop. From there cleaning up some of the brown colors in the image as well as some of the metallic parts is in order. Takes on making adjustments to the colors of the pearl inlay that is in this neckless. You will use masking to refine your adjustments. You will see how to reduce some of the noise in the image as well. Here you will learn how to adjust the metal parts of the pendant and then clean up the lines that form the pendant. Using blur and mask techniques you will be able clean up much of the dust and other distractions. You will see how to use the Liquify too to make the lines straighter and cleaner looking. Through the systematic use of this tool you can make things smoother giving the subject an overall better appearance. Continues with the prior lesson and now focuses on the main body of the pendant. Here you will watch in detail how to clean up all of the metal areas and get everything looking balanced and straight. 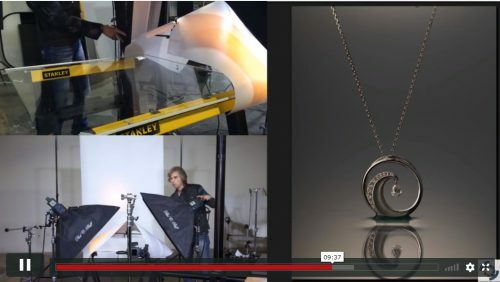 This video shows how to add and enhance the white highlights to make the pendant pop. This will make the shiny metal look much shinier and give the overall image a better glow without hurting the texture and surface look. You also see how to clean up dirt using blur. Through the use of various techniques you will examine how to make the diamonds pop. That includes fixing the white and black areas to provide better definition. You will see how to use masking to isolate areas to make specific adjustments. This lesson looks at how to clean up the water surface using blurring techniques to eliminate unwanted sensor particles, distracting lines, and other things that may prove to be distracting to the image. Noise reduction is used to make the metal look smoother and more polished. Then you will see other techniques to finish up the image to make it really look its best.